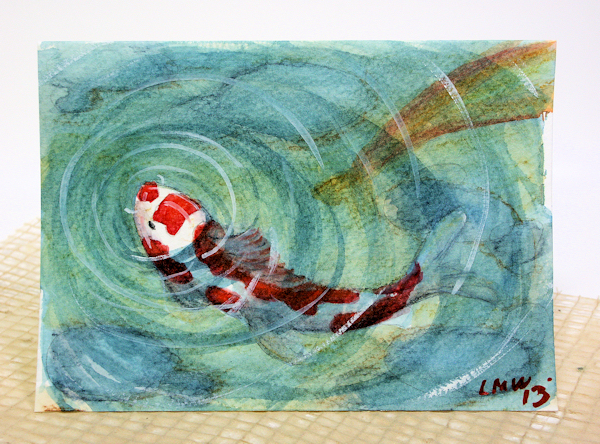 A Free Koi Painting Tutorial plus 50% off My Newest Learn to Paint Lesson! Good morning! 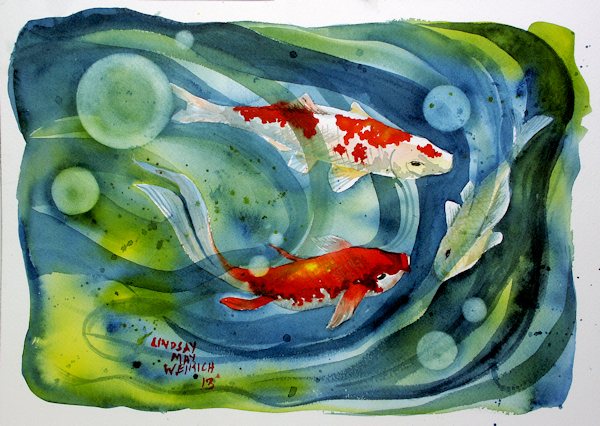 Before I get you sidetracked with out free painting lesson today I want to let you know that EVERYTHING at Lindsay’s Stamp Stuff is 50% off today, that includes my newest painting tutorial to paint this koi pond in transparent watercolor using only 3 colors! This kit is regularly only $3 so you can score it today only for $1.50! OK, I suppose I’ve made you wait long enough! Here is the free tutorial painting koi with watercolor pencils, enjoy! I hope you enjoyed the free tutorial and thank you for checking out my tutorials and other digital products for sale and remember the 50% off sale at Lindsay’s Stamp Stuff is only good until midnight so don’t wait! Thanks for stopping by and til next time happy crafting! I started 6 paintings. I have a method where I start a painting and put in the background and then sketch out and paint the backgrounds on as many paintings as I can while waiting for the first one to dry. I like to work on very wet paper to start so I would have quite lot of ‘sittin’ around waiting’ to do if I did not get to work on other paintings. I started 6 and finished 3! Did I mention we had 6 kids between the two of us. Actually we each have a set of 8-year-old twin daughters who entertained themselves playing with their American Girl dolls while we crafted and our boys wandered about playing video games and chess. You would never have know that there were a half-dozen kids there LOL! I have quite a stack of watercolors to mat and put in clear archival bags to sell at the craft fair, my booth is going to be so schizophrenic looking with the mish-mash of craftyness I have planned but oh what fun it is to plan for a craft fair! BTW, I will be working some of the new paintings into downloadable how-to painting packets for my shop, I’ll let you know when they are available! Thanks for stopping by and til next time happy crafting! 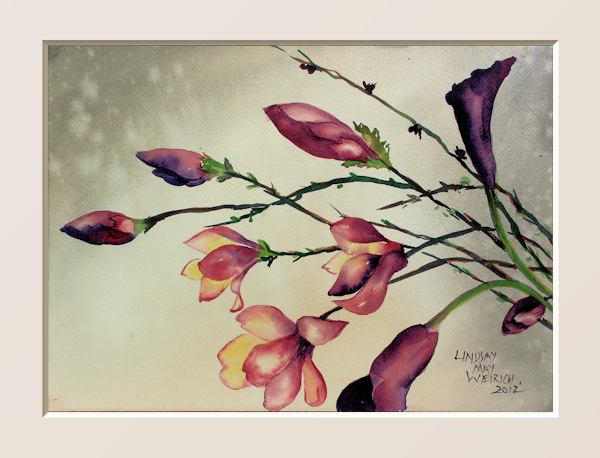 Would like to paint this too? It was very easy and it uses a few fun (they look hard but are easy as pie) techniques. You can get all of the instructions with step by step photos and pattern in the Learn to Paint with Lindsay Kit: Watermelon!